The death toll in the 30-foot bungalow in Telangana state has risen to 57. 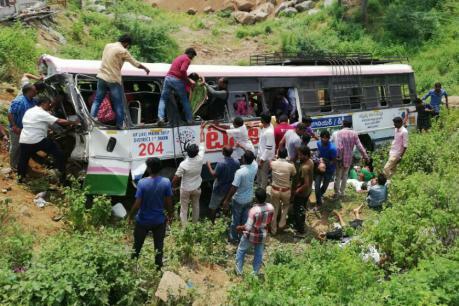 The state government-owned bus was heading towards Jagdiyal area from Anjaneyar mountain temple in Kolakattu in Telangana state yesterday. A bus that lost control of the driver was crashed while returning to the mountain trail in the village of Shaniyarambat. A 4-fold bus was then thrown into a 30-foot ditch. In the incident, 23 people died, including the driver. More than 50 people were injured and admitted to hospital. The number of casualties has risen to 57. Including 39 women and 4 children.